It's a suddenly-chilly and gloomy Fall night here in Atlanta, and the rain is just drizzling away. Thankfully, I couldn't imagine a better spot to be, inside the warm, cozy condo with leggings and fluffy socks on, and a warm bowl of cheesy jambalaya (love that Zatarain's!) to dig into. That, and a glass of red wine, and I am a-ok with this grossness outside. Even more so because I already did my spin class this morning (the 6AM slot is growing on me...) and so I don't even have to go to the gym tonight! This past weekend, we celebrated all that was Fall with football, homemade beers, a cook-out over a fire pit and lots of good food to go around. I had offered up to bring the dessert, and boy oh boy, am I glad that I did. You see, I had stumbled upon a magnificent double-decker Praline Pumpkin Cake on a bloggy friend's site archives last week, and was just dying to have a reason to make it. Not being a huge cake person myself, I love baking them for others and testing out new recipes whenever I have the chance. This one, my friends, was a stunning winner. It turned out beautifully, and you don't have to have too much of a baker's thumb to make it taste just right. A drizzle of caramel sauce on top and along the edges so that it drips down the sides, and it's a picture-perfect Fall spectacle at your table. Enjoy this with some warm coffee and your own loved ones sometime soon! This would make a fantastic update to your traditional Thanksgiving table, but is just suitable for any kind of occasion before then, too. Heat oven to 325°F. In 1-quart heavy saucepan, stir together butter, whipping cream and brown sugar. Cook over low heat, stirring occasionally, just until butter is melted. Pour into two ungreased 9- or 8-inch round cake pans; sprinkle evenly with 1 1/4 cup pecans. In large bowl, beat cake mix, pumpkin, water, oil, eggs and 1 teaspoon of the pumpkin pie spice with electric mixer on low speed until moistened, then on medium speed 2 minutes, scraping bowl occasionally. Carefully spoon batter over pecan mixture in each pan. Bake 45-50 minutes or until cake is lightly browned and springs back when touched in center. Cool 5 minutes; remove from pans to cooling rack. Cool completely, about 1 hour. Stir remaining teaspoon pumpkin pie spice into frosting. To assemble cake, place 1 layer, praline side up, on serving plate. Spread with half of the frosting. Top with second layer, praline side up; spread remaining frosting to edge of layer. 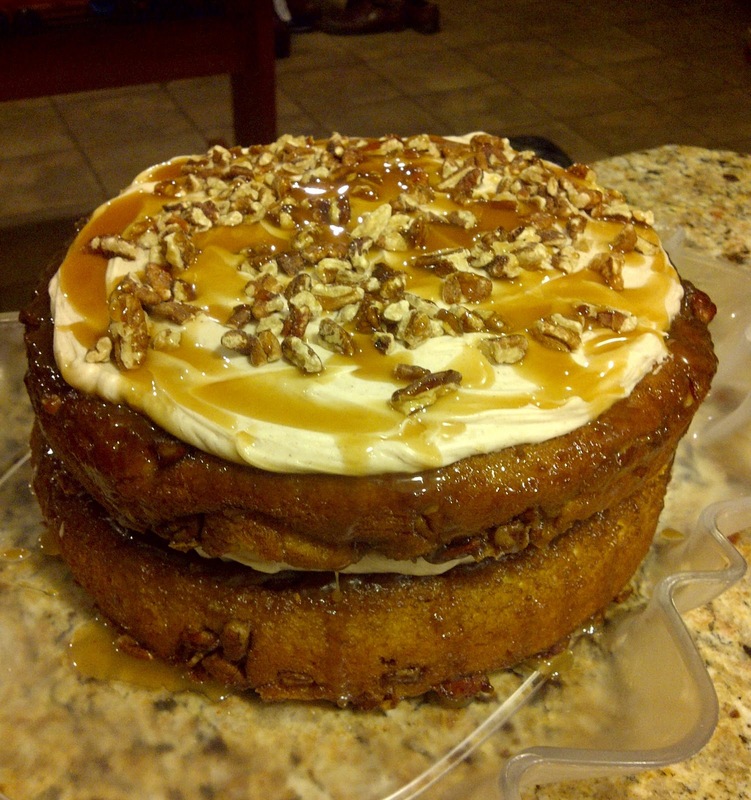 Drizzle with caramel topping and additional pecans. Store loosely covered in refrigerator. Makes 16 servings. Notes from KJM: I bought all of my supplies other than the caramel topping and the frosting from Trader Joe's. Their cake mix was great! I also used springform pans instead of the cake pans, partially because I had two of those, and I also thought the cake might stick. Both halves came out perfectly, but note that if you use springform pans, you will need to put them on cookie sheets because the praline filling will leak! This cake looks absolutely amazing! And good to know you got the cake mix from TJ's - I'll jave to pick some up next time! Elizabeth - I love that TJ's carries so many of those types of basics. The caramel sauce was worth the Publix trip though, so gooey! Check your TJ's for that, maybe they have that too.